Rapnews.co.uk Rapnews.co.uk UK rap, grime and hiphop culture resource! » Blog Archive » Win A Mono Clothing T-shirt! Win A Mono Clothing T-shirt! Try your luck at winning a dope customised Mono Clothing t-shirt or one of two runner up tee’s from their stylish range of designs. All you need is some old skool knowledge. 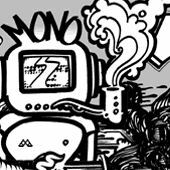 Set up in 2003, Mono Clothing is an independant clothing label set up by graffiti artists and b-boys. Mono produces uniquely tailored quality garments, hand sprayed and printed in short runs. Designs are contributed by the likes of Agro, Miasma and Venk, whilst the label also supports Aspects, b-boy’s Attic break jams, slam poet John Berkavitch and the Gentlemen Rebels crew. Which rapper coined the phrase: ‘Pimpin’ ain’t easy’ ? Include your name, address and your desired t-shirt size. One entry per person. Winners will be chosen at random on the 3rd of February. Good luck! COMPETITION CLOSED. Winners: Lucy, Tommy, Scott.